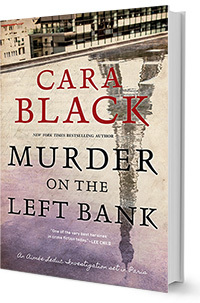 Murder on the Left Bank has been nominated for a Northern California Book Award in the Martin Cruz Smith Award in Suspense/Mystery category! A San Francisco Chronicle and Los Angeles Times best-selling book! 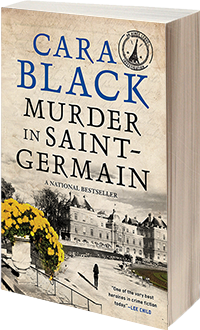 Murder in Saint-Germain is on the list of Kirkus Reviews’ Best Mysteries and Thrillers of 2017! Aimée Leduc is walking through Saint-Germain when she is accosted by Suzanne Lesage, a Brigade Criminelle agent on an elite counterterrorism squad. Suzanne has just returned from the former Yugoslavia, where she was hunting down dangerous war criminals for the Hague. Back in Paris, Suzanne is convinced she’s being stalked by a ghost—a Serbian warlord she thought she’d killed. She’s suffering from PTSD and her boss thinks she’s imagining things. She begs Aimée to investigate—is it possible Mirko Vladić could be alive and in Paris with a blood vendetta? Aimée is already working on a huge case, plus she’s got an eight-month-old baby to take care of. But she can’t say no to Suzanne, whom she owes a big favor. Aimée chases the few leads, and all evidence confirms Mirko Vladić is dead. It seems that Suzanne is in fact paranoid, perhaps losing her mind—until Suzanne’s team begins to turn up dead in a series of strange, tragic accidents. Are these just coincidences? Or are things not what they seem? Cara blogs at Murder Is Everywhere along with nine other renowned crime writers from different corners of the world. Read her posts every Tuesday!